View of how the wood inserts into the chipboard. In actual production of this package, the wood would be denser and the chipboard would be seed-embedded and compostable for use in the pots, or other planting the consumer desired. A view of the reusable factor of the package. All 4 plants fit into the holder. The objective of this collaborative project was to create an environmentally friendly gift box packaging solution that would be reusable in another form. All original components would without modification, be repurposed for immediate use in the alternate design. Cost efficiency was a factor, limiting the cost of production and materials to be reasonably proportionate to the product being packaged. In addition, the package was required to have the ability to lay flat until assembled. 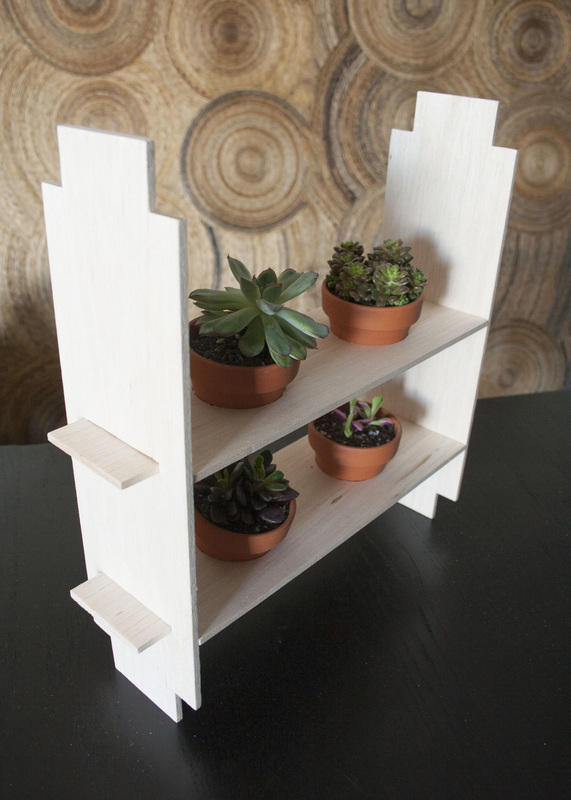 We chose to create a container that would hold miniature table-top house plants, focusing on succulents, yet any plant could be held. The container would arrive flat to the retailer, who would assemble it into a gift box upon request of the consumer. The plants would be placed into the container and sold in lieu of a less environmentally friendly alternative. The recipient of this plant container would be able to easily disassemble the package, then following the instructions provided, reassemble the components into a vertically upright table-top plant holder.